The Ichthyornis is one of the Creatures in ARK: Survival Evolved. Among the most vocal creatures on the Island, Ichthyornis piscoquus actually appears to be a relatively normal seagull. It primarily eats fish, and its distinctive cries can be heard echoing over across the Island's many beaches. As you might expect from a seagull, Ichthyornis will flee at the slightest provocation. Ichthyornis is a versatile and opportunistic hunter. Its primary form of attack is to dive into the top layers of water and impale its prey. However, since its food source can be unpredictable, Ichthyornis has developed a keen ability to steal food from unsuspecting travelers. Their affinity for shiny objects leads them to sometimes knock tools and weapons out of the hands of unsuspecting Survivors, but Ichthyornis is too small to actually fly off with them. Ichthyornis surprised me by being a very loyal and very social creature, once tamed. It likes to ride on its owner's shoulder, and bring that person treats (in the form of fish, of course) which its beak-grip enhances with extra healing vitamins. The personality of Ichthyornis reminds me of a housecat hauling a trophy prey back home, except it brings extra-healthy fish instead. Unlike what their dossier says, the Ichthyornis acts aggressively toward the player, stealing items unprovoked. They do not steal the player's tools, they disarm them and throw it on the ground which they can pick back up. The Ichthyornis does, however, steal the player's food and eat it. The Ichthyornis will attack even if the player has nothing in their inventory. 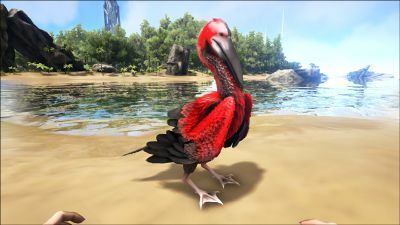 Ichthyornis are a common sight on the coasts of the ARK, and players will often hear their squawking over the pounding surf. They resemble standard modern herons in all aspects, but one. They bear rows of serrated teeth within their beaks - the perfect tools for gripping on to slippery fish. This section displays the Ichthyornis's natural colors and regions. For demonstration, the regions below are colored red over an albino Ichthyornis. The colored squares shown underneath each region's description are the colors that the Ichthyornis will randomly spawn with to provide an overall range of its natural color scheme. Hover your cursor over a color to display its name and ID. For example, "cheat SetTargetDinoColor 0 6" would color the Ichthyornis's "body" magenta. The best way to knock them out is using a bola and 1-4 tranqs, depending on the level. Keep in mind they are weak and might die, it is not recommended to hit them on the head. If the bola wears off before it is knocked out, follow the ichthyornis and it will usually fly to the ground within a few seconds, indicating it is unconscious. Ichthyornis are often found flying around ponds and oceans, rarely appearing on the ground, which can make knocking it unconscious difficult. They can be "forced" to land by killing off all the fish in it's vicinity, which makes hitting them with a bola much easier. Another strategy is to use a Bola and then place a Wooden Cage on top of the Ichthyornis to trap it. Once the Ichthyornis has freed itself of the Bola, it will still be inside the Wooden Cage and will not be able to run away, after which it can then be knocked out. This is also useful if there are multiple Ichthyornis to tame as you can put them into the cage while you finish another nearby tame. This section describes how to fight against the Ichthyornis. As this bird will be one of the first that players encounter, it is important to not attack it unless you are prepared, as they will act as a Pegomastax and steal items from the player, although they won't stop there. Perhaps the easiest way to defend against one is to Bola it when it is sweeping down to steal. From there the player can either tame it or kill it for Hide and Raw Meat. Should the player not have a Bola, then it is best to leave them alone. If the player has a Pteranodon, then one could spin-attack (c, , ) to easily get rid of the attacking Ichthyornis. Use a Bola to bring them to the ground and then you may kill them using the method of your choice. Bola and Spear are great for an easy kill. If you want to tame it, though, a low level only needs a couple of hits with tranquilizer arrows. Like a Pegomastax, the Ichthyornis will steal items from the player. it will knock what is currently in your hand out of your hands, so you'll have to pick it back up. This includes your Bolas, Bow, etc. it won't take items from your hot bar. The Ichthyornis typically has very low health, even at higher levels. A simple crossbow with a couple stone arrows will get the job done, low levels can be killed with only one headshot. When told to attack or thrown at a fish, the Ichthyornis will catch, kill, and return carrying its target. Its prey's corpse will have an aura indicating that collecting from the corpse will provide Prime Fish Meat, even if it is not normally dropped by the target creature. Additionally, there are several land creatures from which it can enable collection of Prime Meat from including Dodo, Pegomastax, Lystrosaurus, Trilobite, and Compy. Its ability to make Prime Meat available from very common and easily killed creatures makes the Ichthyornis a valuable asset for collecting food to efficiently tame carnivores. Collector: Set the Ichthyornis to "hunt and retrieve" and tell it to attack a fish, it will return with a dead fish that can be harvested for Raw Fish Meat or Raw Prime Fish Meat. Larger fish means more meat. 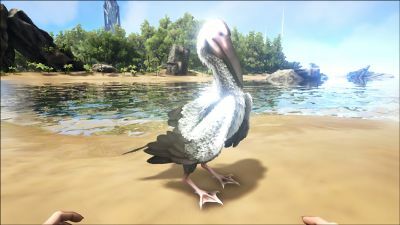 Similarly the Ichthyornis can target Dodos and Compys with "hunt and retrieve", which can then be harvested for Raw Meat and Raw Prime Meat. The line in the dossier: "...and bring that person treats (in the form of fish, of course) which its beak-grip enhances with extra healing vitamins." might be a reference to Prime Fish. Despite the dossier saying its Temperament is Skittish, it is actually quite Aggressive. If there are no fish around or if you get too close, it will steal and eat your food. If you have no food items, it will disarm you and simply attack. For unknown reasons, when a Ichthyornis steals and eats your Narcotics, it will not knock itself out. 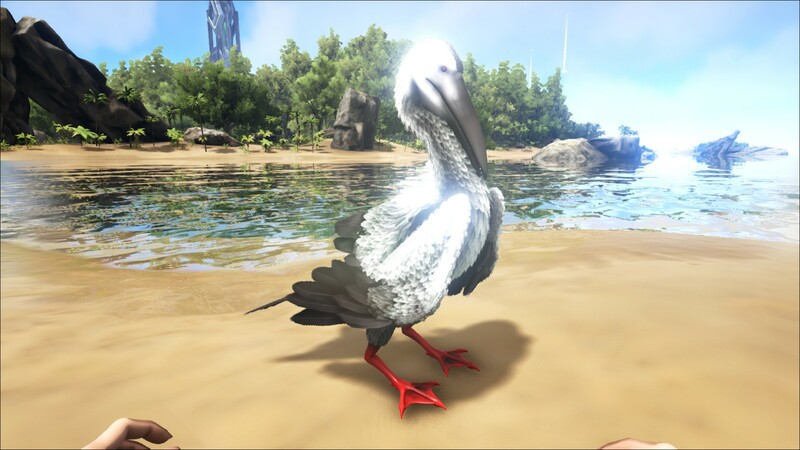 If you have a tame Jerboa or Dodo nearby on land, the Ichthyornis could potentially pick them up and eat them.